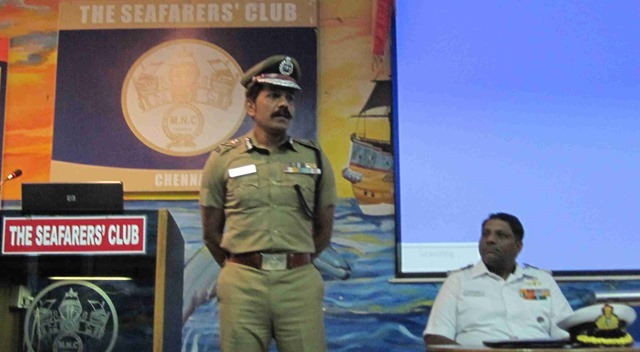 National Maritime Foundation (NMF), Chennai Chapter initiated a Round Table discussion on “Coastal Security Challenges” at Seafarers Club, Chennai on August 17, 2013. Round Table discussion commenced at 1030 hours and concluded at 1245 hours. Dr TS Sridhar, IAS, Additional Chief Secretary, Government of Tamil Nadu; Member, Local Advisory Board, NMF; Former Vice Chairman, Tamil Nadu Maritime Board. Commodore Amar K. Mahadevan, VSM, Naval Officer in Charge, Tamil Nadu & Puducherry. Commodore (Retd) R Seshadri Vasan, Head – Strategy and Security Studies, Center for Asia Studies. Has a coast line of 1076 kms; has 591 fishing villages in 13 coastal districts; has 400 landing points; has 3 major ports; has 7 non major ports. Coastal Security Group (CSG) was formed in 1994. To provide an additional line of defense in the coast line of the country. To prevent the intrusion of militants and anti national elements into the country through sea. To prevent smuggling (in/out) of essential commodities, arms, ammunition, explosives, narcotics, and any other valuable items through sea. To prevent collusion between some fishermen and smugglers/militants to commit unlawful acts in the country. To obtain community participation in Coastal Security. To collect intelligence in all above matters. To co-ordinate with other agencies like State Police, Indian Navy, Indian Coast Guard, Fisheries Department, Customs etc., to improve quality of Coastal Policing. To help the District Administration in the Coastal Districts in Disaster Management. To handle Law & Order situations which may erupt due to clashes between various communities/groups both on shore/off shore. To effectively impose ban on monsoon trawling, fishing as per the law of the land. To protect marine environment and handle environment issues like oil spills, pollution in Territorial Waters through co-ordination with other agencies. To protect the maritime interest of the country. CSG has 6 Zonal Offices located at Chennai, Nagappatinam, Vedaranyam, Pudukottai, Ramanathapuram and Tuticorin. A Toll Free number 1093 is available to call if any help is needed. 12 Marine Police Stations were set up during phase 1; now 30 more Marine Police Stations are coming up during phase 2. Enough expertise is not available to maintain the interceptor boats of CSG. Non availability of trained manpower to man the boats. Non availability of common communication channel to co-ordinate with other stake holders of CSS. Recurring fishermen disputes between Tamil Nadu and Sri Lanka. Use of Unmanned Aerial Vehicles (UAV). Creating a network of intelligence through fishermen. Creating National Coastal Security Corps (NCSC) like National Cadet Corps (NCC). Other suggestions from the audience. CSG can gain the expertise to confidently handle Gemini Crafts from Indian Navy, Indian Coast Guard. If CSG procures longer vessels, it is better to go for metallic hull instead of FRP hull as FRP hulls can be easily damaged in a hostile environment while dealing with smugglers, militants. Fishermen must be part of the CSS to gather intelligence, search & rescue operations. Marine Police must be citizen-friendly for result oriented coastal surveillance. for carrying out awareness campaign by sailing from Chennai to Kanyakumari in their Interceptor Boat. for conducting 960 kms Bicycle Expedition – 2013, along the coast. for their contribution in rescue of Green Ridley Sea Turtle on May 23, 2013. Finally the Round Table Discussion ended by observing two minutes of silence to mourn the human tragedy and loss of INS Sindhurakshak due to fire accident shortly after midnight on August 14, 2013 at Naval Dockyard, Mumbai. Thanks to Commodore (Retd) S Shekhar, Regional Director, NMF to organize this Round Table Discussion.